Primary care physicians in Rochester are testing an app for victims of intimate partner violence. The digital platform was developed by researchers at RIT and Resolve of Greater Rochester. 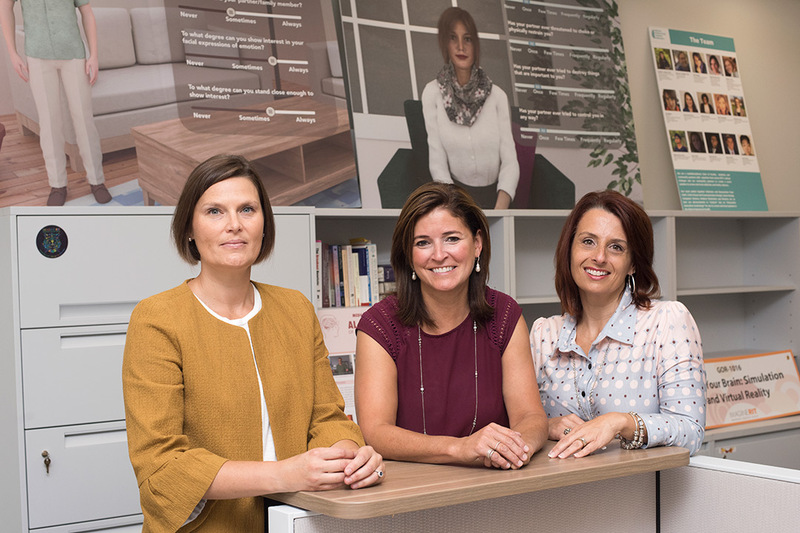 Shown here are Nicole Trabold, left, assistant professor, and Caroline Easton, center, â€™90 (biotechnology) professor, in RITâ€™s School of Behavioral Health Sciences; and Allison Oâ€™Malley, CEO of RESOLVE. An avatar named “RITa®” could give doctors a digital tool for helping patients take steps to end abusive relationships. Researchers and domestic violence advocates at Rochester Institute of Technology and Resolve of Greater Rochester (RESOLVE) created RITa to provide “on demand” domestic violence expertise in primary care settings. Input from victims and physicians in Rochester, N.Y., contributed to the design. Victims of domestic violence often turn first to their family care practitioner, according to Allison O’Malley, RESOLVE CEO. Intimate partner violence is a widespread public health issue that affects one in four women, one in six men and one in two LGBTQ persons in the United States, according to the Centers for Disease Control. O’Malley recognized the need for standardized digital IPV screening and teamed up with researchers Caroline Easton ’90 (biotechnology) and Nicole Trabold in RIT’s School of Behavioral Health Sciences. RITa is more than a digitized data form. The avatar represents a discreet interface for the disclosure of sensitive details, Easton said. The virtual counselor engages and guides victims through 30 validated questions to assess their mental status and safety risk. RITa also teaches victims about healthy versus unhealthy relationship dynamics and the health toll of living with an abusive or violent partner. RITa evolved from Easton’s therapeutic model of care that identifies and treats addiction and anger issues as combined underlying causes of family, domestic and intimate partner violence. Easton’s team translated her alternative treatment approach into the cell phone apps RITch® and RITchie® to screen and treat adult/young adult male offenders. These virtual coaches are used in conjunction with cognitive behavioral therapy to model coping skills for reducing and eliminating alcohol and substance abuse, and for managing aggression. Easton and an RIT student team, led by Steve Maier, lecturer in RIT’s School of Interactive Games and Media, developed the avatar to interface with patients. RESOLVE supported student work on the project with a $15,000 grant from Greater Rochester Health Foundation. O’Malley and Trabold provided the intellectual content and input on the app’s navigational flow. Primary care physicians affiliated with Rochester Regional Health and University of Rochester Primary Care Network in Rochester are offering the software program to patients exhibiting signs of abuse. Health workers from Rochester Regional are also taking RITa into the community. Patients will be offered use of the app when domestic-violence screening suggests a risk or if abuse is disclosed during an office visit. The software is installed on dedicated iPads and is not available on the internet to ensure a secure platform. Protocols provided by O’Malley suggest appropriate language to use when offering and administering the app and reminders to self-monitor personal reactions to patients’ potentially disturbing news. The guidelines also recommend when physicians should follow up with patients and inquire about their action plan. Providers might need to connect victims to resources or facilitate their use of an office telephone to call a hotline. This step avoids the patients’ risk of using their mobile phone and leaving a record of the number for their abuser to find. The pilot study will collect data from 200 patients. Feedback from participating practices will provide insight about administering the app and its impact on workflow.